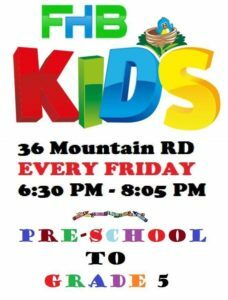 FHB KIDS ministry started September 2016. There was a need in our church for children program that could also benefit youth and adults. We prayerfully considered and reviewed different options and stopped on Vacation Bible School. It seemed to us that VBS is the ministry that everyone knows, loves and excited to be part of as participants as well as volunteers. So, we took an old VBS material that had been used by Forest Hills Baptist Church few years ago, adjusted it to our needs and timing and started a yearlong Vacation Bible School. Each VBS curriculum has lessons sufficient for five weeks. Then, we do a midterm party to which kids are encouraged to invite their friends and parents. The following week we start a brand-new VBS. But, of course we avoid calling our ministry a Vacation Bible School, because we still want our children to be excited about that special week of VBS during the summertime. FHB KIDS is a blessing to our church. We pray that God will continue working through this ministry to reach even more people for the Lord in our community.